The Procedure Browser command displays the procedures in the PDB, the Procedure Database. These procedures are functions which are called by the scripts or plug-ins. Shows a list of procedures which have code names that contain the part of name you entered. Shows a list of procedures which have blurbs that contain the word you entered. Shows a list of procedures which have additional information text that contain the word you entered. Shows a list of procedures which created by the author which has the part of name you entered. Shows a list of procedures which copyright are hold by someone that have the part of name you entered. Shows a list of procedures which have date of year that match the year you entered. This query is processed with text but not date value, so you cannot find some procedure entries even if their date contains the year you entered. For example, a procedure dated 2000-2005 does not match if you search procedures with 2001, but it matches with 2000 or 2005. 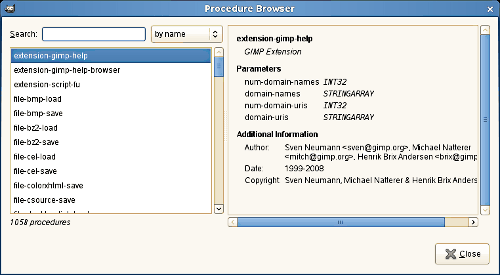 Shows a list of procedures which have a one of four types: “Internal GIMP procedure”, “GIMP Plug-In ”, “GIMP Extension”, or “Temporary Procedure”.